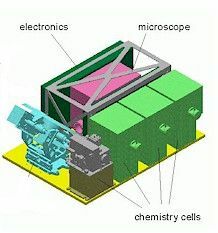 An engineering diagram of MECA, the Phoenix combination microscope. Rumblingsin the media suggest some intriguing findings from NASA's Phoenix Mars Landermission that relate to the question of life, specifically whether it could havesurvived on Mars in the past. The issuebubbled up when it was reported Friday that some interesting results from Phoenix's wetchemistry laboratory, part of the Microscopy, Electrochemistry andConductivity Analyzer (MECA) suite of instruments, were mentioned in a WhiteHouse briefing. Not so,says Phoenix principal investigator Peter Smith, of the University of Arizona, who denied that any details of the MECA findings had been shared and called thereports "bogus and damaging information." The AviationWeek & Space Technology report came on the heels of the Thursday NASAannouncement that Phoenix had confirmed the presenceof water ice at its landing site in Mars' arctic regions, first detected in2002 by NASA's Mars Odyssey orbiter. MECA team members were not present at thepress briefing at which the water-ice announcement was made. "Thegoal [of having no MECA team members present] was to prevent them from beingasked any questions that could reveal information before NASA is ready to makean announcement, sources say," the Aviation Week article said,adding that, "The Bush Administration's Presidential Science Advisor'soffice, however, has been briefed on the new information that NASA hopes torelease as early as mid August." But Smithtold SPACE.com that this was "not true, MECA results have not beendiscussed at the White House." "Thereis no one who knows either on the [Phoenix] project in Tucson or at [NASA] HQwho knows where this information came from," Smith said in a subsequentemail. Smith alsosaid that the MECA team was not present at the Thursday briefing because"they had nothing new to report, the story was about water ice." When thewriter of the Aviation Week story, Craig Covault, was contacted by SPACE.com,he attributed much of the confusion and media hubbub to other news outletspicking up his story and mistakenly reporting that his article said that NASAhad discovered life on Mars. "Notethe [Aviation Week] story said very, very clearly three times or so, NOlife on Mars detected and Phoenix can NOT [detect life] in the firstplace," Covault wrote in an email. Smith addedthat the results from the analysis of the second soil sample in MECA's wetchemistry lab didn't have any bearing on the question of Mars'past habitability "in any direct way." "Weare attempting to assess the chemicals and minerals that make up the soilcomposition," he explained. "We are now about half way through theprocess and there are several conflicting points of view. This is not a goodtime to go public with half the story." Covaultsaid that he stands by his story and noted that his piece mentioned the ongoingreview of MECA data. The wetchemistry laboratory has four teacup-sized beakers, each used only once.Samples of the Martian dirt are place in a beaker and mixed with water broughtfrom Earth. Sensors onthe inner surface of the beakers act like electronic tongues and"taste" the dirt to detect salts that can dissolve in water. Thesensors can also detect the pH of the surface. MECA's firstanalysis showed that the Martian regolith contained several solubleminerals necessary for life, including potassium, magnesium and chloride. Thesurface also had an alkaline pH, which on Earth is suitable for growing someplants, such as asparagus. The second sample, currently being analyzed, wasdelivered to the instrument on July 7.